The Venetians took possession of Methone in 1206 and in 1209 their rule was recognised by Villehardouin with the agreement of Sapienza (Maltezou 1993, 134; Andrews 2006, 54). Along with Corone, they were known as the eyes of the Republic, because their strategic importance allowed control of the seas between south Greece and Africa (Georgopoulou 2001, 17-8). Methone in particular was the point of convergence of the two main eastern sea routes and was used as a stop by the Venetian ships travelling in the east Mediterranean, for getting supplies, for repairing the ships and for getting information (Georgopoulou 2001, 17-8). Methone and its hinterland were valuable for the production of agricultural products especially olive oil as well as for its industries, such as the production of silk and leather (Georgopoulou 2001, 205). Methone was governed by a kastellanos and his councils, a simplified model of the government of Venice. Other institution of the local administration included the treasury and the secretary, which were given very detailed guidelines on how to rule directly from Venice (Maltezou 1993, 136). The castle of Methoni housed the administration of the area, along with the palace of the castellan and other public buildings. The Venetians built the castle during the 13th c. on top of a previous Byzantine castle which stood until the 12th c. and rebuilt the city in 1293 after the decision of the Maggior Consiglio to give the money (Hellenic Ministry of Culture 2001, 16-7; Georgopoulou 2001, 61). The original entrance to the castle was located in the middle of the southeast side (Andrews 2006, 65). The outer walls of the 13th-14th c. were ornamented with entrance gates with pointed arches, crenellated parapets along the outer walls, and of course the lion of Venice (Andrews 2006, 228). 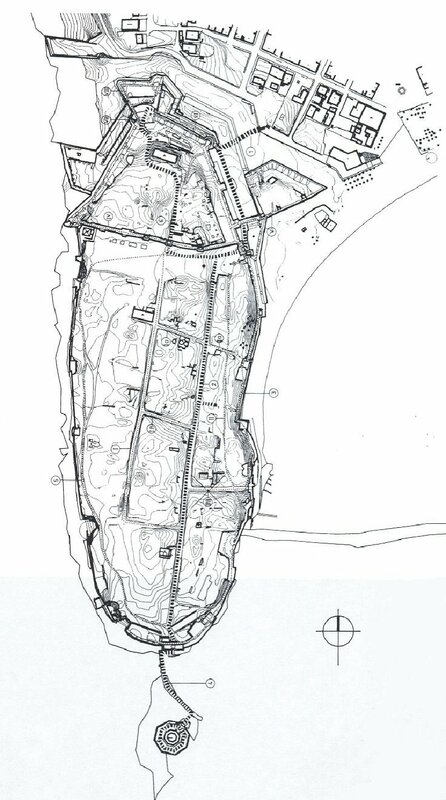 In the early 15th c. especially due to Turkish raids, took energetic measures to secure their colonies, based on documentary evidence, as for example in the case of Methone, the suburbs of the city were encircled by walls (Topping 1972, 69; Georgopoulou 2001, 61). The spatial organisation and architecture of the city imitated up to a point those of Venice and of the piazza of San Marco (a phenomenon observed also in other colonies as in Crete and in Negroponte); for example, the main piazza was lined by the palace and the residence of the governor, shops and large loggias which could be arcaded spaces around the square (Georgopoulou 2001, 82). On of the most important buildings was also the Latin cathedral which was dedicated to St. John and contained the head of St. Athanasios among other relics (Georgopoulou 2001, 118).